The eruption at Nabro is continuing. 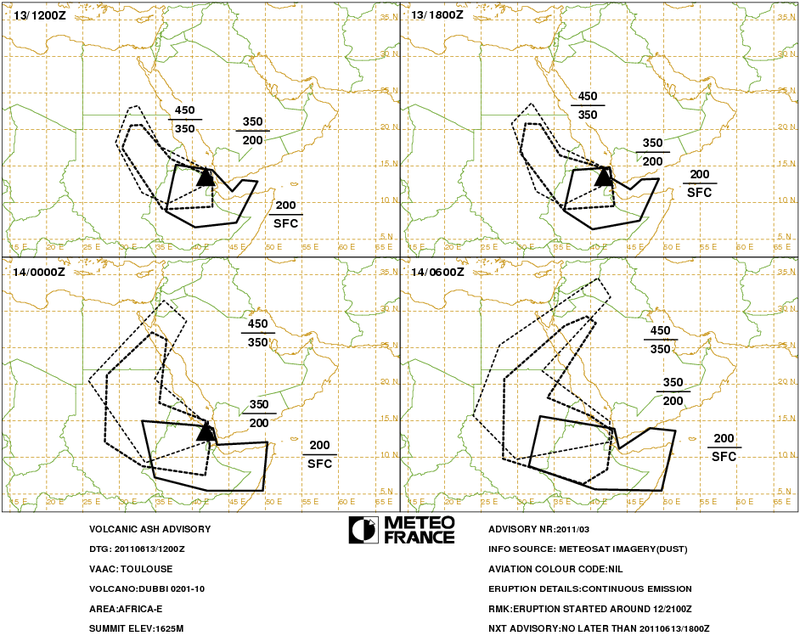 The announcement by Toulouse VAAC yesterday that the eruption had ‘stopped’ was, as we said at the time, not definitive. The latest from Toulouse (18:00 UTC 18 June 2011) is that the ‘eruption currently gets weaker’ and that the plume is ‘mainly composed of SO2 and water vapor’. The VAAC’s prediction for the next 24 hours (graphic here) is that no ash from this eruption will be detectable from 00:00 UTC on 19 June. Ethiopian Airlines has announced that it will be resuming flights to Khartoum after they were disrupted by the ash cloud from Nabro last week. At 08:00 UTC this morning NASA’s Terra satellite captured a MODIS image of Nabro showing a small lightish plume with a diffuse ash cloud drifting south from the volcano. Click on the image to go to the original at the NASA Rapidfire site. Posted by admin in activity reports, Africa, Nigeria. Some rather strange reports from Nigeria seem to suggest some kind of volcanic activity in Gombe State in the north-east of the country: emissions of some kind, possibly including toxic/environmentally harmful gases, have apparently been taking place in the Abaduguri range in Funakaye Local Government Area. North-eastern Nigeria does have a history of active volcanism (although how recently the area was active is not known) so the idea isn’t intrinsically unlikely. Descriptions of the supposed current activity, however, are rather baffling. The Nigerian Observer quotes the National Environmental Standards and Regulations Enforcement Agency saying that ‘the rock, which has been emitting smoke in the past seven months, was a sign of “a dormant volcano which may erupt in future”‘, while a scientist from the Centre for Geodesy and Geodynamics of the National Space Research and Development Agency called the activity ‘a result of the impact of an earthquake that occurred in Pindiga formation, Gombe State, hundreds of years ago’. Elombah.com reports that ‘Local communities living around the Ndanijam Kargo Hill in Funakaye Local Goverment Area and the surrounding villages in Gombe State of the North-Eastern part of Nigeria have been advised to relocate as a result of smoke emission at Abadaguri rocky range because the dormant volcano in the area is likely to erupt any time from now’. The gas has apparently been ‘gushing out from the rocky area’ for seven or eight months, and has ‘an odour of burning plastic’. The Daily Champion reports reassuringly that the Nigeria Meteorological Agency has described the eruption as ‘extinct or dormant’, and adds the interesting information (from a Funakaye local official) that ‘the crack where the smoke was emitting from, used to be the entrance to the house of a renowned hunter in the area, Abbaguri ,who lived in the cafe hundreds of years ago’. Perhaps the situation will become clearer as new reports emerge. Hat tip to Eruptions commenter Shérine for spotting these mysterious reports. UPDATE. Experts from Nigeria’s Centre for Geodesy and Geodynamics have been testing gases at the location of the emissions, reports the Abuja newspaper Daily Trust. Apparently their analysis revealed that ‘gases could result to the formation of magma capable of causing volcanic eruption in the area’. The Toulouse VAAC has issued a new volcanic ash advisory since our last update on Nabro was published earlier this morning. 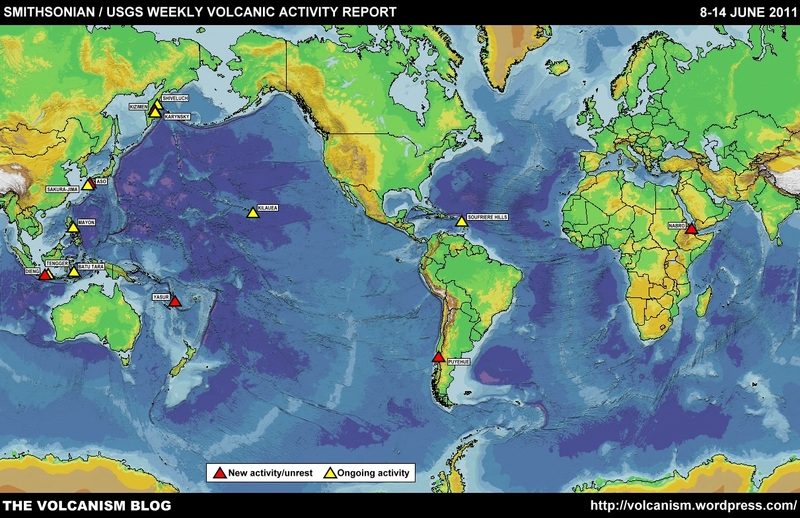 The advisory was issued at 06:00 UTC 17 June 2011 and reports that ‘eruption stopped 16/1500Z’, that is, 15:00 UTC on 16 June (an earlier advisory at 00:00 on 17 June had indicated that ‘eruption seems to pause about 15 UTC’). This is not definitive: the eruption may have ended, or it may simply be in remission for a while. Time will tell. UPDATE. Stopped? Or not? Irish Weather Online: Nabro volcano erupts again Friday after moderate quake. Busy now, more on this later. FURTHER UPDATE. Irish Weather Online have retreated somewhat from their claim that there has been a fresh eruption from Nabro today: the title of the post linked to above has been changed from ‘Nabro volcano erupts again Friday after moderate quake’ to ‘Magnitude 5.5 earthquake hits near Nabro volcano’. The story originally reported that ‘a 5.5 magnitude earthquake on Friday morning led to a further increase in volcanic activity’ and that ‘Friday’s eruption has sent a massive ash plume westnorthwest over Sudan threatening to bring further disruption to air traffic in the east Africa region’. Now the claim is simply that ‘a 5.5 magnitude earthquake on Friday morning could lead to a further increase in volcanic activity’, and the tale of the massive plume has quite vanished. [Just a quick update on the Nabro eruption, as I have a busy day today.] 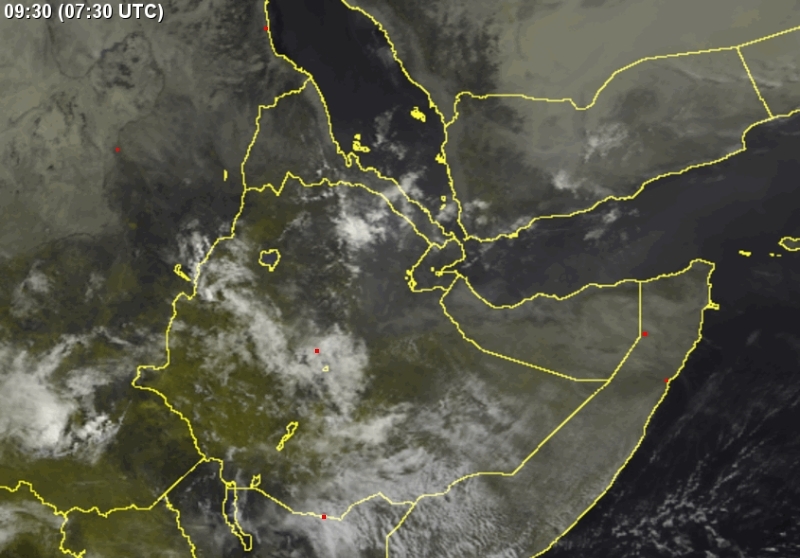 Satellite images of Eritrea and Ethiopia this morning seem to show a quieter situation at Nabro, the Eritrean volcano that began erupting on Sunday night and produced an impressive plume yesterday. No sign of such a plume today: on first examination it’s difficult to distinguish any volcanic emissions from surrounding cloud. Below are two images from Sat24.com, showing the situation at 07:30 UTC this morning. 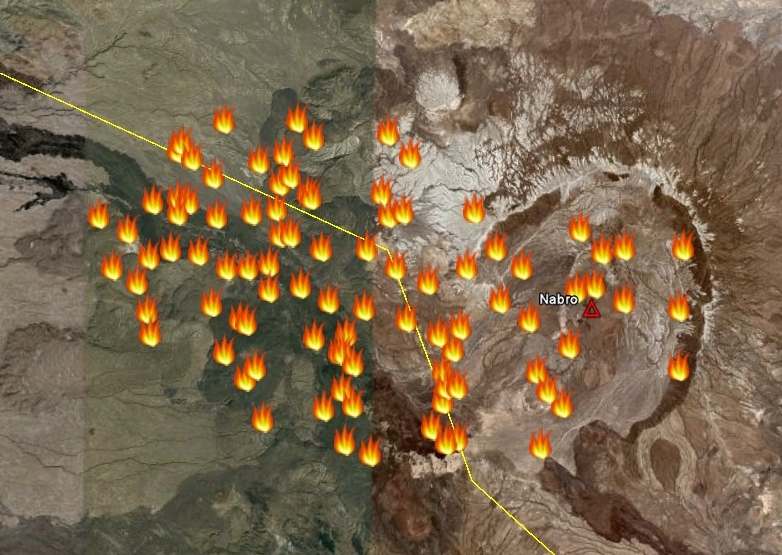 The likelihood is that this event is a fissure eruption which had an explosive component at an early stage. Nabro has seen such fissure activity before, and perhaps not that long ago (in geological terms), but with so much of this remote and little-studied volcano’s history and character being unknown it’s difficult to state anything for certain. Above. Visual image of Eritrea/Ethiopia, 14 June 2011 07:30UTC (Sat24.com/Eumetsat/Met Office). Click on the image for full-size version. Above. 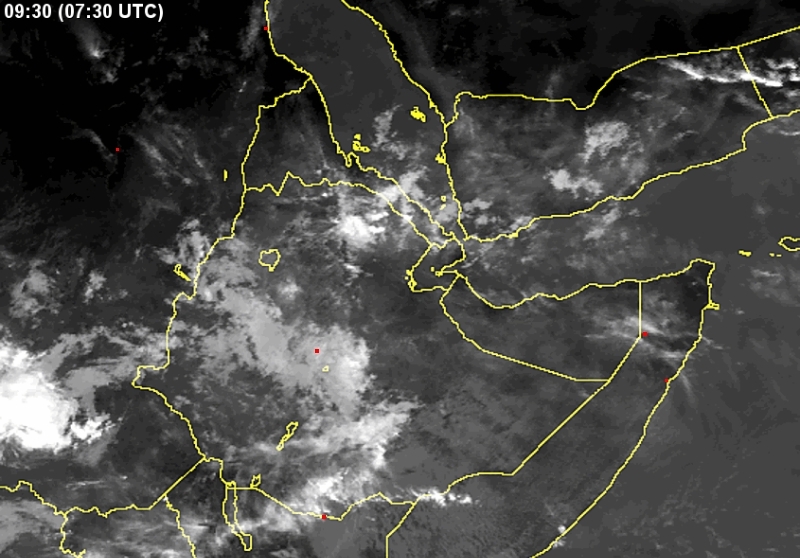 Infrared image of Eritrea/Ethiopia, 14 June 2011 07:30UTC (Sat24.com/Eumetsat/Met Office). Click on the image for full-size version. 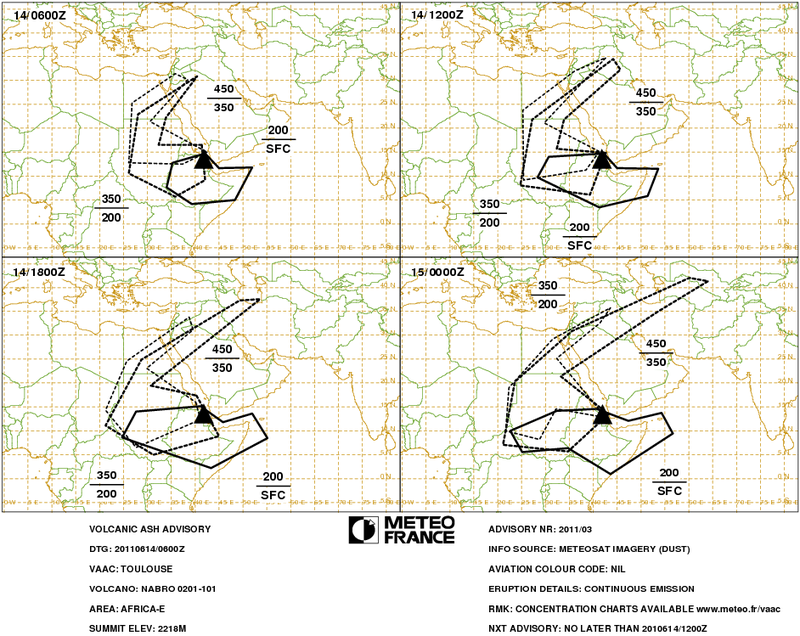 The latest volcanic ash advisory from Toulouse VAAC, issued at 06:00 UTC, reports ‘continuous emission’ from the volcano with ash at between FL200 (20,000 feet/6000 metres altitude) in the vicinity of the eruption to FL450 (45,000 feet/13,700 metres altitude), predicted to reach at its extremes as far west as Chad and as far north as Uzbekistan by this afternoon. Assab, 13 June 2011 -A volcanic eruption was witnessed in the tip of the Southern Red Sea region at 9 p.m. yesterday. Reports indicated that the eruption that took place in 4 different areas around Afambo, Nebro and Sireru causing a 5.7 rector scale earth tremor. The ensuing dust is covering hundreds of kilometers in the area, and that the quake has been heard in the greater portion of the region as a whole, according to reports. The Southern regional Administration disclosed that the Government has moved the inhabitants in the area to a safe place, in addition to providing them with the necessary care. No damage has so far been inflicted to human life , the Administration added. Although similar earthquake incidents were witnessed from time to time in previous years, yesterday’s tremor was of higher scale that led to volcanic eruption. A volcanic eruption appears to have begun around the time of the last 5.7M earthquake, at about 21:00 UTC. 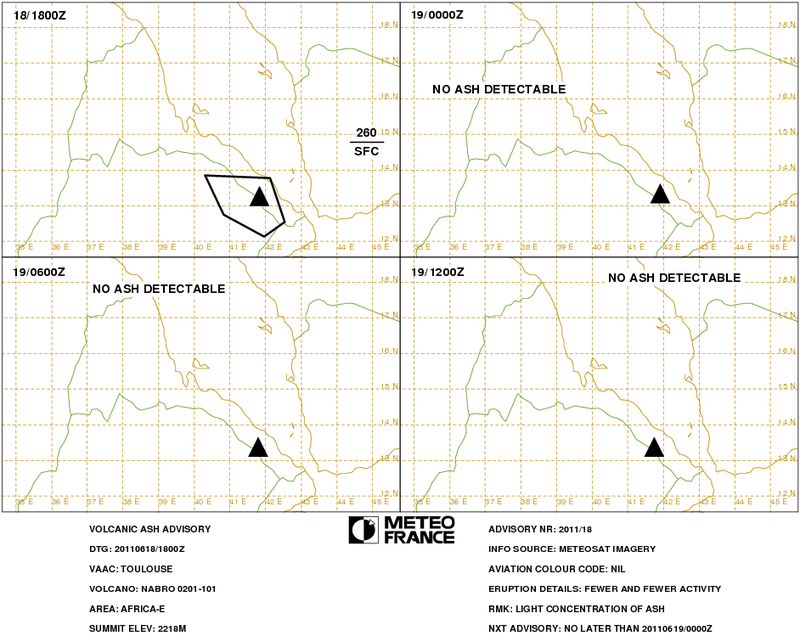 Toulouse VAAC identified the volcano as Dubbi and issued two Volcanic Ash Advisories so far for this eruption today: at 04:00 UTC the eruption was reported to have started at 23:00 UTC on 12 June 2011, and to have produced a plume between FL150/300 (15,000-30,000 feet/4,500-9,000 metres altitude), while at 06:00 UTC the volcano was described as being in ‘continuous emission’ with ash at FL300/450 (30,000-45,000 feet/9,000-13,500 metres altitude) and trending W/WNW. Eumetsat image, 08:00UTC. Thanks to Eruptions commenter Shérine France for providing the link. Click on the image for the original. Dubbi was responsible for the largest known volcanic eruption in Africa in historical time, in 1861: more than 100 people were killed, ash fell more than 300 km from the volcano and the lava flows travelled 22 km and reached the Red Sea. 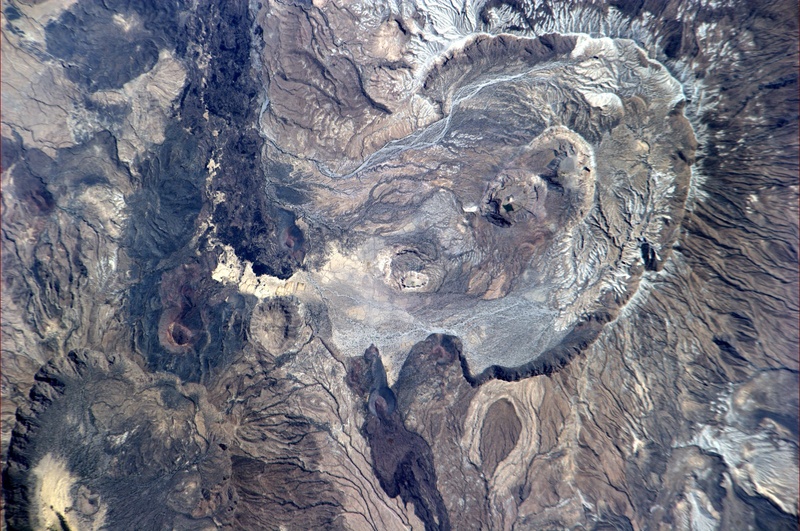 Other possible candidates for the current eruption include Nabro and Mallahle. UPDATE. Via Oxford volcanologist David M. Pyle’s Twitter,here are MODIS images of the Eritrea volcanic ash plume. Thanks to Clive Oppenheimer of Cambridge University (via Earthquake-Reports) we have a useful news report from the Cambridge Geography Department site related to Clive’s Eruptions that Shook the World book: Eruption in Eritrea, 12 June 2011. ‘Loud explosions were heard in Afdera, across the border in Ethiopia, and ashfall is reported as far as Mekele in Tigray province’ … the identity of the volcano is still to be confirmed – Nabro or Dubbi? And more coverage can be found at the Simplement Géologie blog (in French), Séisme et éruption volcanique en Éritrea, Afrique, and at Volcano Blog, Eruption of Dubbi in Eritrea. The Irish Weather Online site has identified the volcano as Nabro rather than Dubbi, on the grounds that satellite images show plume is originating at a point too far south to be the latter. Nabro has no recorded Holocene eruptive activity, so its awakening would be an interesting development. Confirmation one way or the other is still awaited. ACKNOWLEDGEMENTS. A major source of information on this eruption has been the comment thread at this post over at Dr Erik Klemetti’s Eruptions blog. And excellent ongoing coverage is available at Earthquake-Report.